Earlier this year I was fortunate enough to be invited to the Morrisons Nutmeg AW16 clothing event. Along with Roo and Tigger, we had an amazing time, although we left wanting almost everything from the new range. One of the items that Roo picked out for Piglet was a beautiful flower knitted dress complete with tights. Knowing how much I love knitted dresses she knew that it would win me over in a heartbeat. There is something so cosy and cute about girls in knitted dresses with matching tights that I just adore. This gorgeous knitted dress is available within the Nutmeg at Morrisons AW16 range. 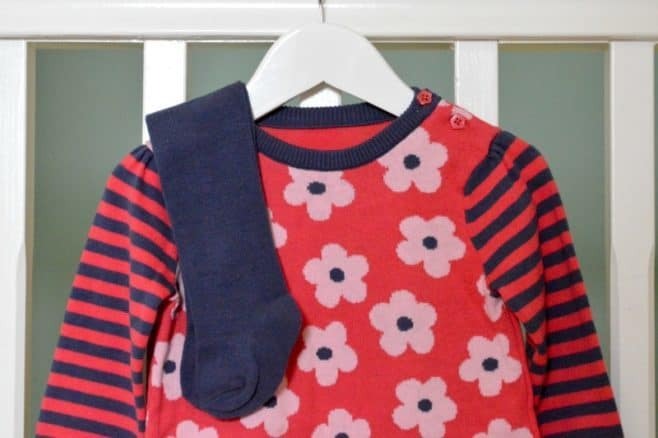 A cute pink and navy dress that is a cosy dress ready for autumn and winter. The front of the dress is decorated with navy flowers with contrasting striped sleeves. A plain back and navy tights complete the look. With two flower shaped buttons on one shoulder, it allows for ease of dressing (unless you have a particularly wriggling baby). Piglet wears the 9-12m size and as you can see she still has plenty of growing room available. Both in terms of length and around her chest and tummy. The navy tights that come with the dress finish off the outfit and are a great quality. 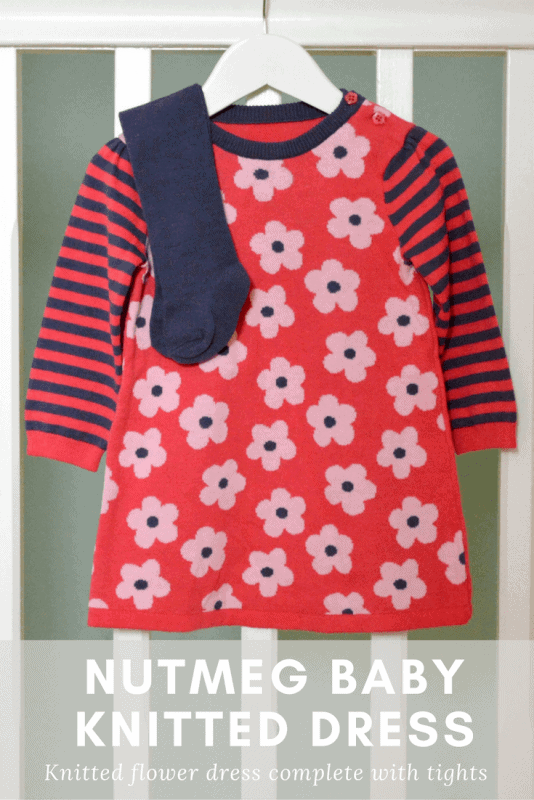 The knitted flower dress is available to purchase within the Nutmeg clothing section within most Morrisons stores. I am a sucker for knitted dresses they do look super cute in the winter months. Also allows Piglet to be cosy and warm whilst giving her the freedom of movement from a dress. As she starts to walk I can see this looking fab teamed with first shoes and even boots.